화성 봉림사 목조아미타불좌상복장전적일괄은 당시 방대한 화엄경을 은니로 사성한 것 가운데 잔권(殘卷)이나 고려말에 사경 신앙의 면모를 살필 수 있는 중요한 자료이다. 수진본(袖珍本) 금강반야파라밀경(金剛般若波羅蜜經)은 금강경(金剛經)으로 약칭되는 구마라십(鳩摩羅什) 역(譯)의 금강반야파라밀경(金剛般若波羅蜜經)이다. 권수(卷首)에 신중상(神衆像)과 설법상(說法像), 금강경계청(金剛經啓請), 정구업진언(淨口業眞言), 팔금강상(八金剛像)과 사보살상(四菩薩像), 발원문(發願文), 운하범(云何梵)이 본문 앞에 실려 있다. 그리고 권말에 지기(誌記)가 있고 이어서 범자(梵字)로 된 불정심타라니(佛頂心陀羅尼) 등 6개의 짤막한 타라니(陀羅尼)와 여의인(如意印) 등 10개의 부(符)가 있고 마지막에 강금강(姜金剛)의 인출기(印出記)가 붙어있다. 금강경은 한국 불교의 가장 중심되는 위치에 놓였던 경전이다. 구도자(求道者)는 사물(事物)에 대한 집착을 뛰어 넘고 나와 너라는 대립 감정을 없애야 실체를 바로 깨달을 수 있음을 강조한 공사상(空思想)을 설(說)한 경전이다. 이 책은 호신(護身) 또는 독송용(讀誦用)으로 판각(版刻)한 수진본(袖珍本)이다. 지기(誌記)에 의하면 각원(覺圓)이 비구(比丘) 달현(達玄), 영흥(永興) 등과 신사(信士) 이기(李琦), 전대동(田大同) 등과 함께 발원하여 고연(古燕)에서 우연히 본국(本國)의 승려 홍회(洪淮)이 쓴 소자본(小字本) 금강경을 구하여 고려(高麗) 충선왕(忠宣王)3년(年)(1311)에 판각(板刻)한 것임을 알 수 있다. 그리고 마지막에 붙어 있는 인출기(印出記)를 보면 고려 충숙왕복위(忠肅王復位)8년(年)(1339)에 진성군(晉城君) 강금강(姜金剛)이 시주(施主)하여 인출(印出)하였음을 밝히고 있다. 이 수진본(袖珍本)은 한동안 수지독송(受持讀誦)하다가 복장(腹藏)되었던듯 일부 헤어진 곳도 보이고 있다. 그러나 인출기(印出記)에서 볼 수 있는 바와같이 판각된지 18년후에 인출한 것으로 글자에 마멸이 별로 없고 인쇄 상태가 양호하다. 이 책이 나온 봉림사(鳳林寺) 목조여래좌상(木造如來坐像)의 개금기(改金記)에 의하면 고려(高麗) 공민왕(恭愍王)11년(年)(1362) 개금(改金)때 복장(腹藏)된 것으로 추정된다. 이 판본은 고려시대 금강경 독송을 위한 수진본으로 당시 금강경 신앙의 형태를 볼 수 있는 자료일 뿐 아니라 원나라에서 활약하던 강금강에 의해 인출한 책으로서 동일본의 간행과 인출관계를 뚜렷하게 살필 수 있는 자료로서의 가치도 있는 것이다. 감지은니대방광불화엄경(紺紙銀泥大方廣佛華嚴經) 권제사십팔(卷第四十八)은 감지에 은니로 쓴 주본(周本) 화엄경(華嚴經)80권 가운데 제 48권이다. 내용은 화엄경 전체 39품중 제 34품 여래십신상해품(如來十身相海品)과 제 35품 여래수호광명공덕품(如來髓好光明功德品)이 수록되어 있다. 비록 변상도와 발원문 또는 사성기(寫成記)가 없는 것이 흠이고 표지 장식이나 본문 글씨가 뛰어나지는 않으나 고려 사경에서 볼 수 있는 전형적인 사경체의 특징을 지니고 있으며 전체적인 품격으로 보아 고려 말기의 사경으로 추정된다. 이 당시 방대한 화엄경을 은니로 사성한 것 가운데 잔권(殘卷)이나 고려말에 사경 신앙의 면모를 살필 수 있는 자료이다. 백지묵서묘법연화경(白紙墨書妙法蓮華經) 권제이(卷第二)는 법화경 28품 가운데 제 3비유품(譬喩品)과 제 4신해품(信解品)이 수록되어 있다. 전체 7권 가운데 잔권(殘卷)이므로 사성기(寫成記)가 실려 있지 않아서 확실한 사성연대(寫成年代)는 알 수 없으나 보물(寶物)315호(號) 광흥사(廣興寺) 소장(所藏)의 백지묵서 묘법연화경과 체제가 비슷하고 표지는 내소사(來蘇寺)의 백지묵서 묘법연화경의 표지와 유사하다. 그러므로 전체적인 품격(品格)으로 보아 고려말(高麗末)에서 조선조(朝鮮朝) 초기(初期)에 사성(寫成)된 사경으로 추정(推定)된다. 백지묵서범망경(白紙墨書梵網經)은 양질의 두꺼운 백지에 먹으로 쓴 범망경이다. 권말에 사성기(寫成記)가 없고 다만 ‘화주(化主) 혜상(惠尙) 묘원(妙圓) 최신성(崔信誠) 시주(施主) 경화택주(慶和宅主) 이씨(李氏) ’ 등 사경(寫經)에 참여한 화주(化主)와 시주자(施主者)의 이름이 기록되어 있을 뿐이다. 그러나 이들의 생존시기(生存時期)가 미상이므로 사성시기를 아는데 도움이 되지 않는다. 다만, 뒷 표지의 장식과 본문글씨로 보아 조선 초기의 사경으로 추정되며 달필로 정성껏 만든 사경가운데 하나이다. 과주(科注) 묘법연화경(妙法蓮華經) 합부(合部)는 전체 7권을 얇은 종이에 앞뒤로 찍어내어 한 책으로 제본한 것이다. 더구나 본문위에 본문을 과주(科注)한 것을 붙여 내용을 알기 쉽게 하였다. 이 책은 우리 나라에서 간행한 것이 아니라서 확실한 간행년대는 알 수 없으나 명태조(明太祖)의 명(命)에 의해서 간행한 대보은사판(大報恩寺版) 대장경(大藏經)의 영향을 받은 명나라 초기(初期)의 간본으로 추정된다. 소자(小字) 금강반야파라밀경(金剛般若波羅蜜經)은 모두 5장에 경문을 수록한 것이나 둘째장이 없어졌다. 권말의 무의자혜심(無衣子慧諶)(1178∼1234)의 발문에 의하면 사문 보관(普觀)이 발원하여 간행했다. 여기서 정혜쌍수(定慧雙修)를 주창하신 보조국사 지눌의 조계산 수선사(修禪社) 제(第)2세국사(世國師)인 혜심의 발문이 붙어 있어 이 낱장본의 가치가 더욱 두드러지는 것이다. 발문의 내용은 보관(普觀)이 일반인들이 바로 본심을 깨쳐들어 가지는 못하더라도 교(敎)를 통해 단계적으로 수행하기 위해 가장 요긴한 금강경, 법화경보문품, 화엄행원품 등을 도인(道人) 열가(悅可)에게 부탁하여 쓰게 하고 권말(卷末)의 범자대장신주(梵字大藏神呪)는 혜귀(惠歸)에 부탁하여 쓴 것을 시랑(侍郞) 이굉(李紘) 삼중대사(三重大師) 문광(文光)이 힘을 합쳐 간행한 것이다. 소자(小字) 범총지집일부(梵摠持集一部)는 금강경 낱장과 함께 진행된 것으로 보인다. 소자(小字) 불정심관세음보살대타라니경(佛頂心觀世音菩薩大陀羅尼經) 권상(卷上), 중(中), 하(下)는 권말에 2행의 발문이 있는데 둘째행은 보이지 않고 간행년대도 알 수 없다. 그러나 이것은 청하상국(淸河相國)의 수복(壽福)을 빌기 위해 간행된 것임을 알 수 있는데, 이 청하상국은 고려 고종때 권신(權臣) 최우(崔瑀)로 추정되고 있으며 앞에 보인 낱장과 인쇄 조건이 비슷하므로 고려 고종때 간행으로 생각된다. The pocket-sized edition of Vajracchedika prajnaparamita Sutra (The Diamond Sutra) is based on Vajracchedika prajnaparamita Sutra, translated by Kumarajiva. The sutra is preceded by a series of images and texts, including a portrait of gods, sermon scene, ‘Geumganggyeong gyecheong,’ ‘Jeonggueop jineon,’ a portrait of eight Vajra Guardians and portrait of four Bodhisattvas, prayer text and ‘Unhabeom’. At the end of the sutra, there is a postscript, followed by six short Dharanis including the Nilakantha dharani (The Great Compassion Mantra), ten bu (符) including a yeouiin (如意印), and the printing information by Kang Geum-gang. The Diamond Sutra used to be the most fundamental scripture in Korean Buddhism. The text from which the philosophy of emptiness derives, the Diamond Sutra emphasizes that the seeker of enlightenment must abandon all attachment to worldly things and the distinction between the self and other in order to comprehend the true essence of being. This pocket-sized edition is meant to be carried for the protective effect of the sutra or used as a memory aid for recitation. According to the postscript, this publishing project was initiated by Gakwon, along with several bhiksus including Dalhyeon and Yeongheung, and upsakas including Yi Gi and Jeon Dae-dong. In Goyeon, they happened onto a small-character edition of the Diamond Sutra, written by a Goryeo monk by the name of Honghoe, and carved printing blocks based on this text, in 1311, according to the same postscript. Meanwhile, in the printing information at the very end of the book, it is said that the printing of the sutra took place in 1339, on the funding of Kang Geum-gang (aka Lord Jinseong). This copy of the pocket-sized sutra, with some worn sheets and frayed edges, appears to have been used for a while before it was placed inside the Buddha statue. The quality of printing, on the other hand, is comparatively good. Although the sutra was printed eighteen years after the printing blocks were carved, as can be deduced from the printing information, there are hardly no blurred characters from defacing of the woodblocks. Meanwhile, the seated wooden Buddha inside which this sutra was found was re-gilded in 1362 (the 11th year of King Gongmin’s reign during the Goryeo Dynasty), according to the record also discovered within. The pocket-sized Diamond Sutra is, therefore, likely to have been placed inside the statue at the time of its re-gilding. As a pocket-sized version of the Diamond Sutra for recitation, this book is informative on the religious practices of Goryeo. Meanwhile, the availability of complete publishing and printing information about this book, printed under the patronage of Kang Geum-gang who was based in Yuan China for a time, adds to its value. Volume 48 of the Avatamsaka Sutra (The Flower Garland Sutra) in Silver on Indigo Paper is one of the 80-volume Zhou Version of the Avatamsaka Sutra. 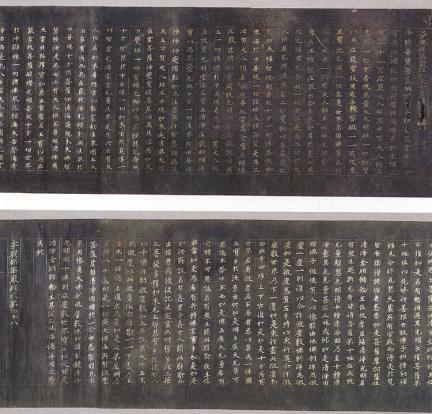 This scroll contains the 34th and 35th of the 39 total chapters of the Avatamsaka Sutra, ‘Yeorae sipsin sanghaepum (Ocean of Physical Marks of the Ten Bodies of Buddha)’ and ‘Yeorae suho gwangmyeong gongdeokpum (Qualities of the Buddha's Embellishments and Lights).’ This copy of the sutra, without illustrations or a prayer text, has a number of other flaws as well. It does not provide, for instance, information about the circumstances of transcription, and the cover page art is rather mediocre while the handwriting is not the most attractive or assured. 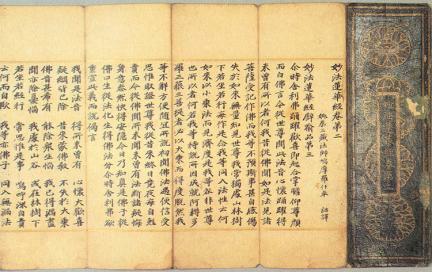 Displaying the characteristics of a typical hand-copied Goryeo sutra, it appears to date from sometime in late Goryeo. The only surviving portion of a vast Avatamsaka hand-copied in silver, this scroll, nevertheless, provides important glimpses into the practice of hand-copying Buddhist scriptures in late Goryeo. The second volume of the Saddharmapundarika Sutra (The Lotus Sutra) in ink on white paper contains two of the sutra’s twenty-eight chapters: Chapter 3. ‘Biyupum (Simile and Parable)’ and Chapter 4. ‘Sinhaepum (Belief and Understanding).’ Being one of the seven total scrolls making up this sutra, it does not provide information about the circumstances of transcription. Its exact date of transcription is, therefore, unknown. But, it is similar to the Transcription of Saddharmapundarika Sutra (The Lotus Sutra) in Ink on White Paper (Treasure No. 315) of Gwangheungsa Temple, in its general organization. Meanwhile, its cover shows similarities to that of the Lotus Sutra in ink on paper of Naesosa Temple. The dates of these other Lotus Sutras suggest that this one was hand-copied sometime between late Goryeo and early Joseon. The Brahmajala Sutra (The Sutra of Brahma’s Net), also part of this ensemble of scriptures, is written in ink on thick sheets of white paper. 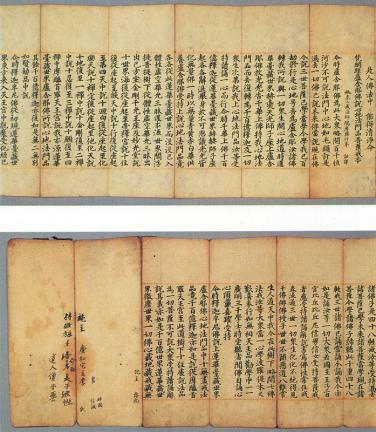 The sutra provides no information on the circumstances of transcription, but lists names of those who took part in hand-copying of the sutra including Hyesang, Myowon and Choe Sin-seong, and the name of the donor who funded the project, Yi of the Gyeonghwa House. However, as the birth or death date of none of these people is known, their names do not offer any clue about the date of transcription of the sutra. But, based on the style of decoration of the back cover and the style of handwriting, this hand-copied sutra appears to date from sometime in early Joseon. At any rate, this Sutra of Brahma’s Net is among the better made hand-copied sutras, written with great care and in elegant script. The annotated single-volume Lotus Sutra contains the total seven volumes of the Lotus Sutra by printing on both sides of thin sheets of paper. Annotations are added above the main text on each page, for ease of reading and understanding. This book was not published in Korea, and its date of publication is unknown. But, the sutra appears to have been published sometime in the early Ming dynasty, under the influence of the Dabaoen Temple Tripitaka, published on the order of Ming Taizu. The small-character Prajnaparamita Sutra (The Diamond Sutra), originally consisting of five sheets, is currently missing the second sheet. According to the postscript by Monk Hyesim (1178-1234) added at the end of the book, the publishing of this sutra was a project by Monk Bogwan. 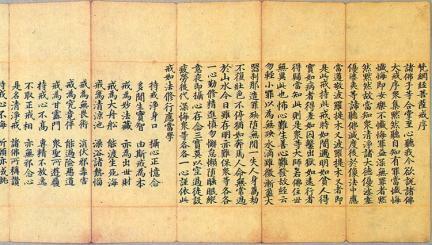 This postscript is followed by another postscript by Hyesim, the heir of the State Preceptor Bojo’s movement known as “Jeonghyessangsu” emphasizing the importance of coupling Zen and wisdom, based in Suseonsa in Jogyesan Mountain that the latter made into the base for this movement; something that makes this loose-sheet sutra yet more valuable. The postscript says that although it might be challenging for ordinary people to learn to contemplate Amitabha Buddha and the general surrounding, Yeolga was asked to transcribe the most essential texts for progressively introducing them to the practice of meditation, such as the Diamond Sutra, Universal Gate chapter of the Lotus Sutra and the Universal Worthy’s Conduct and Vows chapter of the Avatamsaka Sutra, while Hyegwi took charge of writing Beomja daejang sinju, included at the end of the volume. The postscript also states that this book was published through joint efforts between Yi Goeng and Monk Mungwang. Meanwhile, the printing of the small-character beomchongjijip ilbu appears to have taken place at the same time as the loose-sheet Diamond Sutra. The three-volume small-character Nilakantha dharani (The Great Compassion Mantra) have a two-line postscript at the end, but the second line is illegible, making it impossible to determine the date of publication. From this postscript, one learns, however, that this book was published to prayer for the happiness and health of Cheonghasangguk. The name “Cheonghasangguk” appears to designate Choe U, the powerful member of King Gojong’s court during the Goryeo Period, considered the de facto ruler of the dynasty at that time. Based on the quality of printing, similar to the quality of printing of the loose-sheet sutra, this book is likely to have been also published during King Gojong’s reign.